This story by Simon Beckett is red hot, a real page-turner. I read it in two sessions, as it's one of the best first books of a British author, I've read in a very long time. 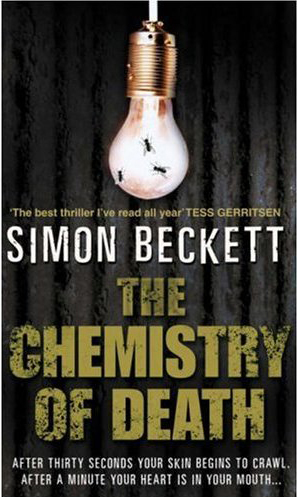 It's written very much in the tradition of books by Kathy Reichs or Kathryn Fox but whereas they are both medical doctors and the forensic medical background is part of their training, Beckett was a journalist on the Daily Telegraph who wrote his story after doing a piece for the his newspaper magazine about an American Forensic Training Establishment in Tennessee (The Body Farm). A former British Forensic Expert, Dr David Hunter, decides to give up his speciality when a tragedy hits him personally and he loses his wife and daughter in a car crash. He decides to do general practice and applies for and gets a post to work as a GP in a lonely little town in Norfolk. He successfully works anonymously as a GP there for three years, until a series of very savage murders starts occurring and the Superintendent of the local police force doesn't have the expertise locally to analyse the complexities of the savage murders and he calls for expert help from the nearest big town, Ipswich. They tell him, "… but you have one of the country's leading forensic experts working in your town!!" So, very unwillingly at first, Dr David Hunter is forced to help the police out, but then he finds he is getting personally involved and the story takes off like a rocket and the pages whiz by as Beckett really gets the reader involved with the story. This novel was short-listed for the 2006 CWA Duncan Lawrie Dagger and I'm looking forward to reading the next one from this author, which is called WRITTEN IN BONE.